Fits neck sizes up to 20"
Small Dogs up to 55 lbs. The spray barking control collar targets your dog's ultra-heightened senses for immediate results. Stop barking with the smallest bark collar on the market. This small, lightweight spray bark collar corrects nuisance barking with a surprising mist of spray. Its compact design is perfect for little dogs. The Little Dog Spray Bark Control Collar effectively stops barking. The Spray Bark Collar For Small Dogs has a unique patented sensor that provides the most reliable bark detection available. The Small Dog Spray Bark Control Collar uses both vibration and sound sensors (patented Dual Detection) to discriminate each bark from other external noises. A burst of lemon-scented spray is emitted to deter barking only if both the vibration from vocal chords and the sound from the bark match the same criteria. Combining modern electronics and dog training modification techniques this citrus spray bark collar will stop excessive barking. The Spray Bark Collar for Small Dogs is effective, safe and painless. It needs no human intervention to work and has no secondary negative effects. 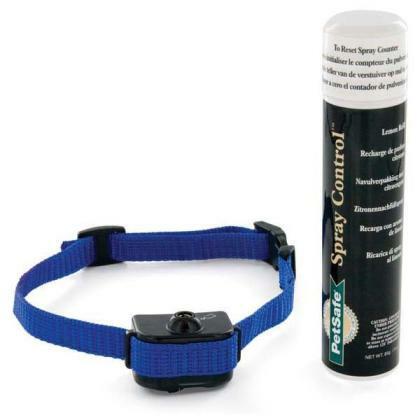 In fact the spray dog barking collar has a calming effect. The collar is comfortable and will fit dogs of all sizes. Clinical studies conducted by the College of Veterinary Medicine at Cornell University have proven that spray bark collars are TWICE effective as shock collars! Sonic dog barking collars are virtually ineffective compared to spray.